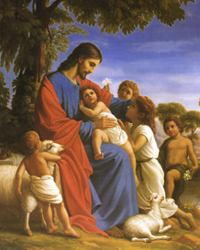 In the scriptures in Luke 9:48, Jesus speaks about children. That verse reads this way in the KJV, “And said unto them, Whosoever shall receive this child in my name receiveth me: and whosoever shall receive me receiveth him that sent me: for he that is least among you all, the same shall be great.” Jesus speaks about children in a lot of different places and how we are supposed to be like children. It can be a little confusing a lot of the time, but when he speaks, he’s talking about faith. If you ever observe a child and their parents, a child usually believes everything their parents tell them because they love and trust their parents. Christ wants us to love God the same way! Each day we should trust God and live the way he wants us to and that pleases the Father. I have found in my own life that I am happier, more content, and satisfied when I trust my Heavenly Father. As this verse tells us that, we should receive a child in his name. He is telling us that we have a duty to less mature Christians than we are and that duty is to show them our child like faith as we trust God. An old song that some of the lyrics say, Trust and obey for there’s no other way to be happy in Jesus. Let’s all live to please our Heavenly Father.